Do we practice PDCA at the micro, annual & long term level? Do we set time aside for improvement every day? Do we have a personal improvement plan for ourselves? Do we reflect on target vs. actual and make corresponding adjustments? Or are we like the doctor who chain smokes? Or like psychiatrist whose personal life is a mess? If we all we do is talk about standards, problem solving & PDCA -- then we are all talk. 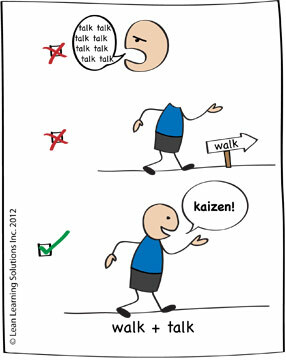 But if we take time each day for improvement -- we'll become kaizen people. Let each of us reflect with humility. Great post & high time. Lean community needs a wake up call.